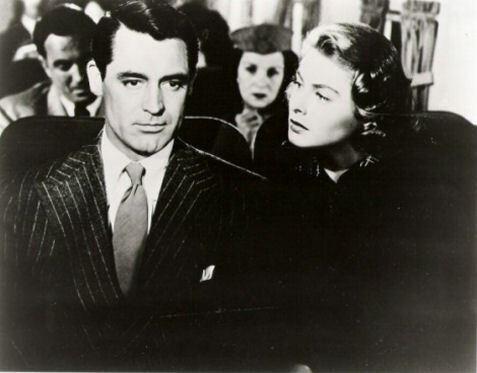 "Everyone grows older--except Cary Grant," Grace Kelly once observed. The sun-bronzed actor with the big, brown eyes, cleft chin, and that unique accent all his own has thrilled generations of moviegoers, not just with his sensational looks but with his brilliant, comedic timing. Grant, in his heyday, was the only actor who could make his leading lady laugh while at the same time sweeping her off her feet. The name of Cary Grant on a theater marquee promised audiences the best entertainment and has always delivered it. Grant's films have a timeless appeal and continue to captivate audiences more than half a century after their original release. Grant was born Archibald Leach, the son of Elias and Elsie Leach, 1904, in Bristol, England. At the age of 13, Archie ran away from home to join Bob Pender's acrobatic troupe. Archie's father caught up with him and made sure his son returned home. Two years later Archie ran away again--this time his father allowed him to stay. In 1920 the Pender troupe arrived in the United States. Archie graduated from stilt walking and clown routines, to Vaudeville, Broadway and then Hollywood. Archie made his first full length feature film This Is the Night in 1932 using a new name---Cary Grant. Years later Grant shared the story of how he received his name with Roderick Mann: "When I arrived in Hollywood the studio said, 'Archie just doesn't sound right in America.' I said "It doesn't sound particularly right in Britain either. And then I told them the worst part --my middle name is Alexandria. It was meant to be Alexander, but they made a mistake on my birth certificate." 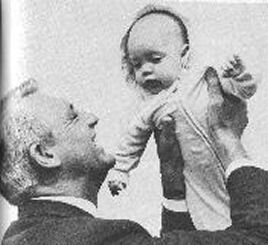 And so Cary Grant was born, a name as sleek as tile medallions, and timeless as the stars. Grant signed a contract with Paramount and where he was assigned leading man roles. 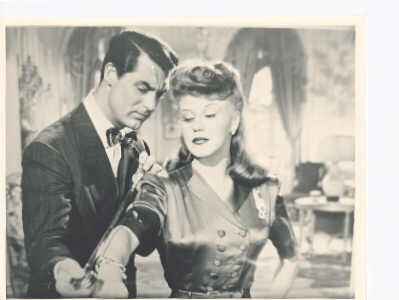 It was in the film Sylvia Scarlett (1936) that Grant first showed his comic promise, playing a cockney scoundrel instead of the leading man that gets the girl. Grant gave a multi-layered performance, outwardly comedic with dark, dramatic undertones, attributes he would not have a chance to exhibit again until he teamed with director Alfred Hitchcock in the early forties. It was after Grant's contract at Paramount ended that he made what turned out to be a very wise, creative and financial decision. He signed two non-exclusive contracts with RKO and Columbia. Grant retained script approval and was able to choose the best projects, for the highest salaries, not being tied to one studio. At a time when actors taking percentages of films was unheard of, Grant worked out a deal whereby he retained all the rights to his films after seven years distribution. This alone made him a millionaire many times over. 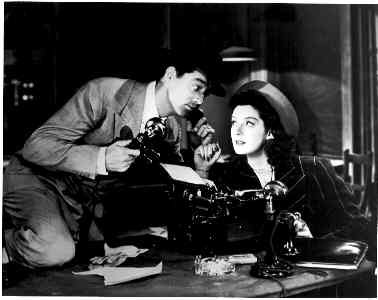 During Grant's first year of freedom he began to make the screwball comedies, he's so famous for; Topper and The Awful Truth (1937) followed by Bringing Up Baby (1938) with a young radiant Katherine Hepburn, the fast-paced Howard Hawks film His Girl Friday with Rosalind Russell, My Favorite Wife (1940) with Irene Dunne and the sparkling The Philadelphia Story (1941). Cary Grant gave one of his finest, zaniest comedic performances in Arsenic and Old Lace (1944), a film Bob Hope turned down. 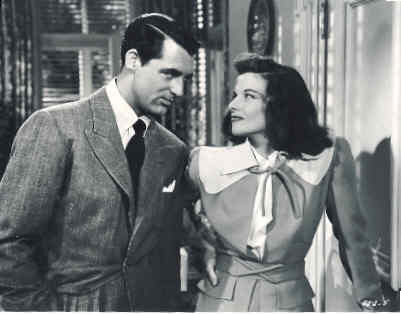 Who could forget the sight of suave yet panic stricken Cary Grant trying to convince his two sweet, maiden, murdering Aunts that it's not right to put their lonely, old gentleman callers out of their misery by poisoning their elderberry wine. It was a splendid piece of work. 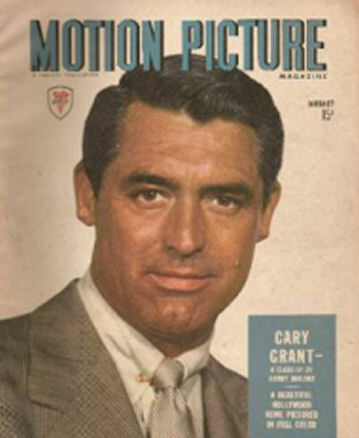 In his private life Cary Grant married five times, pretty blonde Virginia Cherrill (1934-1935), Woolworth heiress Barbara Hutton (1942-1945) and his longest marriage was to lovely, effervescent actress Betsy Drake (1949-1962).Grant said at this time of his wedding to Drake, "Betsy is the first wife I've had who is also a friend." 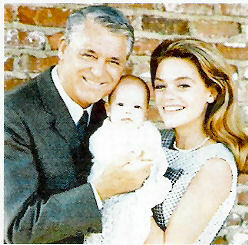 His fourth wife Dyan Cannon (1965-1968) gave birth to his only child, a beautiful daughter Jennifer in 1966. His last, and by all accounts, happiest marriage was to Barbara Harris. 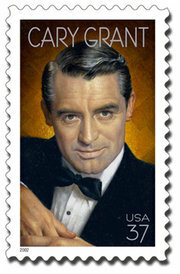 When most of us think of Cary Grant, the great comedies he's renowned for come to mind. 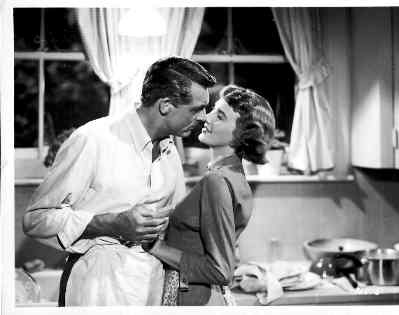 However, not all of Cary Grant's best films were comedies. He was Oscar nominated twice for dramatic films for Penny Serenade (1941) and None but the Lonely Heart (1944). Alfred Hitchcock once said: "One doesn't direct Cary Grant. ; one simply puts him in front of the camera." Grant's unforgettable Hitchcock thrillers include: Suspicion (1941), and Notorious (1946). 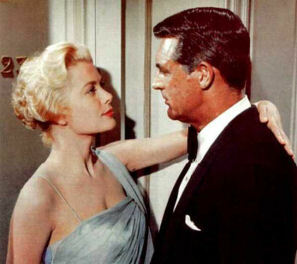 After a brief retirement in the early fifties, Hitchcock persuaded Grant to make the jewels of his career, To Catch a Thief (1955) and North by Northwest (1959). Although past fifty years old, Grant was trim, suntanned and at the height of his talent when he made the suspense films. In a recent American Film Institute Poll, North by Northwest scored highly as one of the best films of all time. 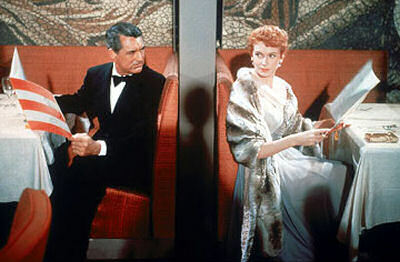 The adventure film Gunga Din (1939), the Hitchcock styled Charade (1963) and the shipboard romance classic An Affair to Remember (1957) are also Cary Grant favorites. 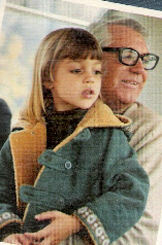 Cary Grant retired from the screen in 1966 to spend more time with his much adored daughter Jennifer. The business acumen he showed as a young actor, being one of the first to get percentages of his own films, was put to good use when following his retirement he chose to pursue other business interests such as Faberge Cosmetics and the MGM Grand Hotels. In 1970, Cary Grant, who grew more handsome as he matured, accepted a special Oscar, an award long overdue. Frank Sinatra presented the Oscar to Grant saying: "No one had brought more pleasure to more people than Cary has, and nobody has done so many things so well. Cary has so much skill he makes it all look easy." Silver haired Cary Grant, who was always pestered with questions how he managed to look so long, once said "I'd like to think I don't look my age, but I know I do. I may look good for my age, but that's something else." 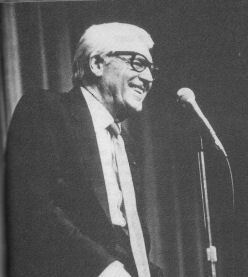 In the last years of his life, author Nancy Nelson (Evenings with Cary Grant (William Morrow & Company, 1991) persuaded the actor to perform in a one man show-- a question and answer forum with the audience supplying the questions. Grant's only stipulation was that the seats not cost more than $25.00, making it affordable for fans to come see him. It was following a rehearsal, for this one man show, that Grant became ill and died of a massive stroke on November 29, 1986. There was no extended, lingering illness but a quick death doing something he loved. When asked about his illustrious screen career, Grant once said, "Let the tall dark, smooth haired guy stay where he is on the late night movie. He's very immature compared with me, but I quite liked him". 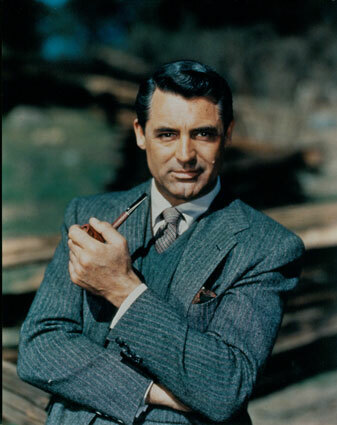 And generations to come will continue to be captivated by Cary Grant. 1984-2015. This article may not be reprinted without permission. Buy True Hollywood Noir by Dina Di Mambro today! A tantalizing mixture of classic Hollywood nostalgia and true crime, True Hollywood Noir: Filmland Mysteries and Murders , featuring 100 rare photographs, is suspenseful, entertaining, and eminently readable. While viewers were captivated by the drama playing out on the silver screen, the lives of the stars of these film noir classics were often far more exciting. The film plots of these stylish black and white masterpieces pale in comparison to what was going on behind the scenes. Uncover the true stories in a dozen different chapters featuring William Desmond Taylor, Thomas Ince, Jean Harlow, Thelma Todd, Joan Bennett, Lana Turner, George Reeves, Gig Young, Bob Crane, Natalie Wood, Robert Blake, and Mickey Cohen. Included in the cast of characters of the Thomas Ince chapter are William Randolph Hearst, Marion Davies, and Charlie Chaplin. And in the Mickey Cohen chapter, find never before told stories about Ben "Bugsy" Siegel, Virginia Hill, and a host of notorious underworld figures. BOOK - TRUE HOLLYWOOD NOIR - Uncover true stories of Hollywood mysteries, scandals & murders in a dozen different chapters featuring William Desmond Taylor, Thomas Ince, Jean Harlow, Thelma Todd, Joan Bennett, Lana Turner, George Reeves, Gig Young, Bob Crane, Natalie Wood, Robert Blake, and Mickey Cohen. Included in the cast of characters of the Thomas Ince chapter are William Randolph Hearst, Marion Davies, and Charlie Chaplin. And in the Mickey Cohen chapter, find never before told stories about Ben "Bugsy" Siegel, Virginia Hill, and a host of notorious underworld figures. has written extensively about classic movie stars of the golden age of Hollywood from the time she was a teenager. Her book Television Series Regulars of the Fifties and Sixties In Interview (McFarland Publishing, written under the name Dina-Marie Kulzer) consists of 22 in-depth interviews with stars of classic TV series and was originally published in 1992. In addition, she has worked as a research consultant and provided materials for biography specials about Carole Lombard for the A & E Network and E! Entertainment Television.